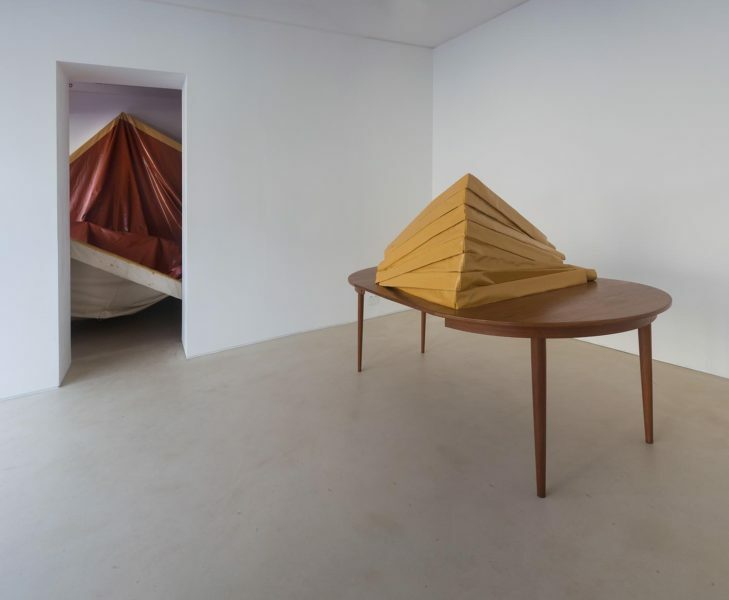 Angela de la Cruz, Larger than Life, 2004, and Table, 2016, PEER, 2016. Courtesy Angela de la Cruz and PEER. Photo Chris Dorley-Brown. Image courtesy Chris Ofili and PEER, 2016. Photo Chris Dorley-Brown. Hoxton Street, London, 2016. Image courtesy PEER. Photo Chris Dorley-Brown. The modern mythology of the East End records the arrival of the YBAs in Shoreditch in the late 1980s. Attracted to this run down inner city neighbourhood where unlovely warehouse spaces were dirt cheap to rent, recent Goldsmiths graduates surviving on Margaret Thatcher’s Enterprise Allowance scheme faced down freezing winters, worked like crazy and partied even harder. By the mid 90s, the occasional, switched-on Japanese student might be seen wandering Hoxton Square in some bewilderment, trying to reconcile reports of a red-hot art scene with the prevailing sense of drear dilapidation. 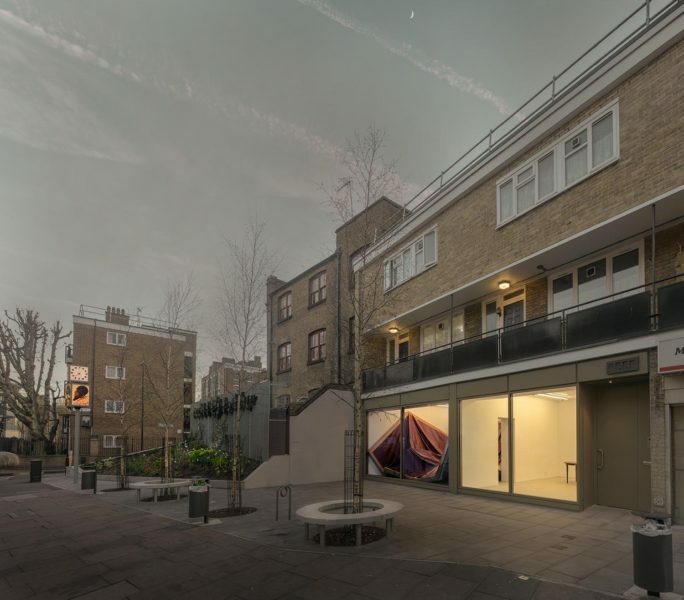 Artists can’t afford to live there any more, White Cube gallery has been and gone from Hoxton Square and what is left is a kind of bridge-and-tunnel party central. Try getting through the area by car of a weekend and you will find yourself cursing at the traffic jams at 2am. While the tides of international venture capital swirl around the district, building ever-higher glass towers, in some places the original population is still going about life as usual. Hoxton Street is just such a place, with its street market, housing estates and schools. PEER art gallery has been based here since 2002 and its recently completed remodelling, together with the redesign of the streetscape in the immediate vicinity are an exemplary instance of what cultural bureaucrats call “place making”. 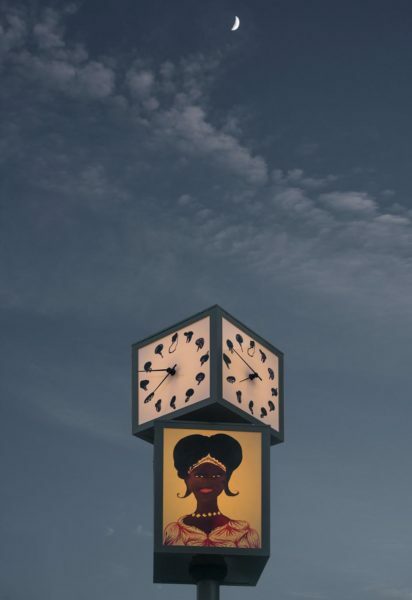 Walking down from Shoreditch High Street you come first to the newly commissioned pedestal clock with its face made up of twelve Chris Ofili Afroheads, sitting above a cubic lightbox with four Ofili Afromuses rotating calmly at the crank of the road. “Meet you by the clock?” – it is an instant landmark, dignified by some really great art from one of the original artist-tenants of the area. 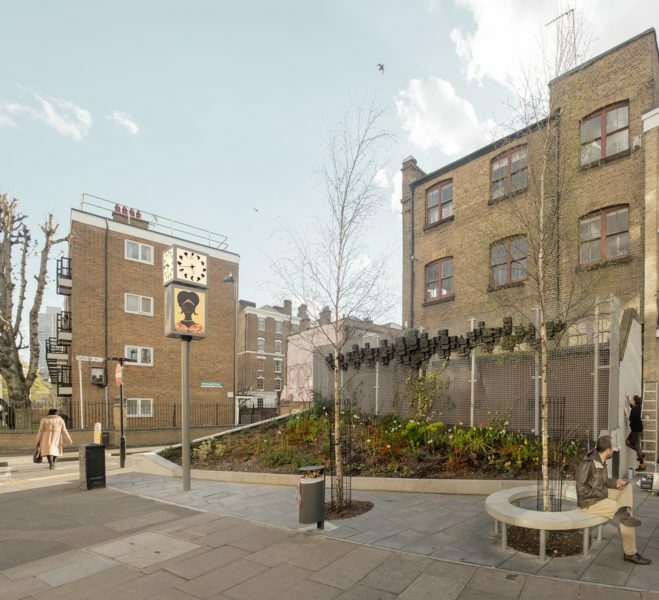 The clock will host an annual commission from an artist – an inspired idea that chimes with PEER’s mission to put great art into the public realm. 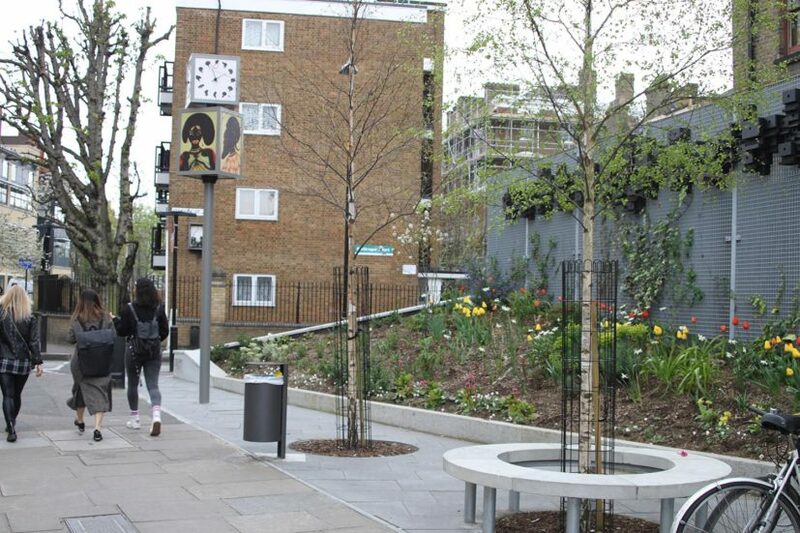 A little further on PEER has co-opted a formerly litter-strewn and unloved corner and built an urban micro-park. This chilly spring afternoon it was cheery with tulips and the metal trellis behind it sports a permanent commission by London Fieldworks (Bruce Gilchrist and Jo Joelson). 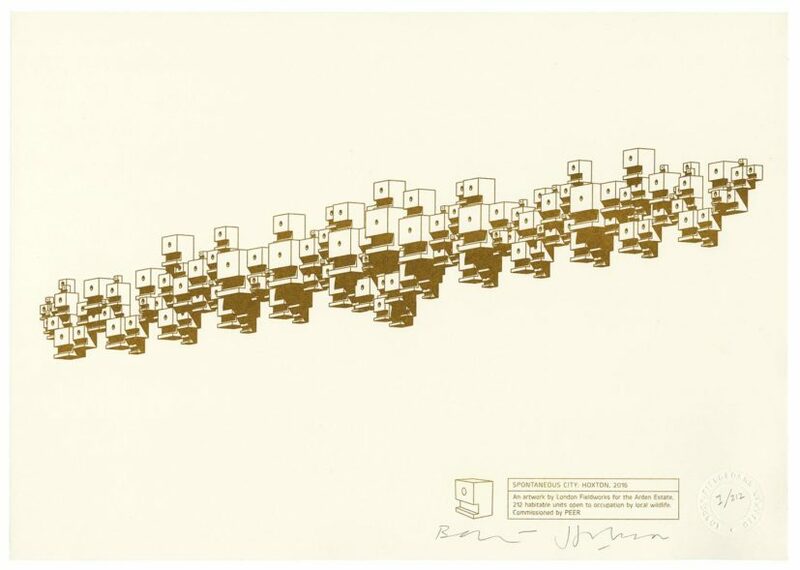 An elegant installation of 212 bespoke boxes open to occupation by local wildlife. This sculpture echoes the dense housing typical of the neighbourhood, and one hopes to return in the future to see birds and bugs having taken up residence. 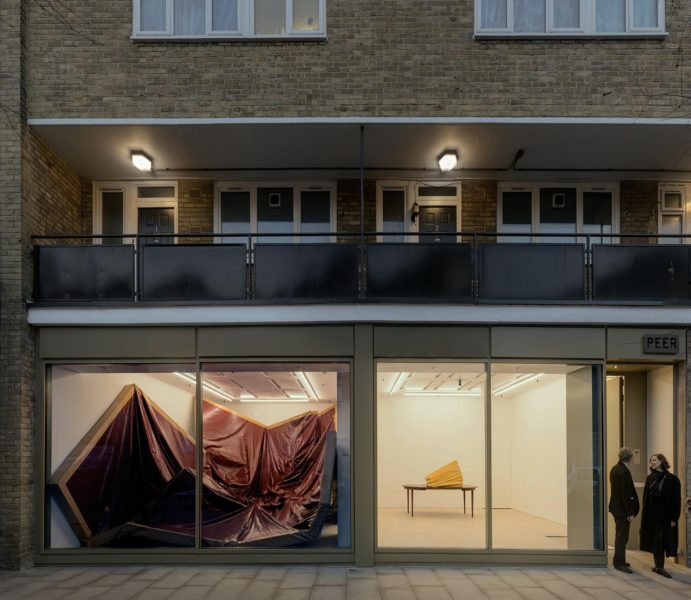 Work to the gallery itself has neatly unified the original two shopfronts with floor to ceiling windows, creating an almost seamless connection to the street. As I stood inside a young woman walking past unplugged from her earphones and gestured to the Angela de la Cruz. “It’s art, right?” she asked, peering through the glass – “Yes!” we replied, grinning. She grinned right back and nodded with satisfaction, before plugging back in and passing on. Happy customer. Job done. 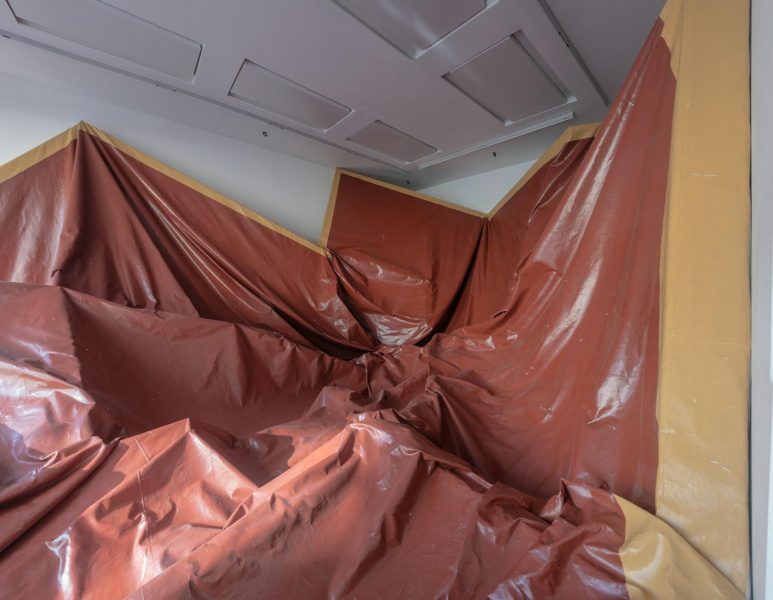 The opening exhibition is just two works by Angela de la Cruz: in the far space the immense 1998 (remade in 2004) work Larger than Life occupies the gallery like a painterly shipwreck. Crumpled canvas on a fragmented stretcher brokenly, but magnificently inhabits the space, properly letting go of itself, while next door the newTable, 2016, sits neatly in relatively prim contrast. When something difficult is done exceptionally well, it looks effortless. PEER’s new incarnation is an object-lesson in sensitive yet ambitious development on a small scale. Go and take a look.